Ironically, the title of Arch Oboler's only novel House on Fire became a reality during the Woolsey Fire in late 2018. The house was gutted and its future is uncertain. In the 1940s, radio and television personality Arch Oboler and his wife Eleanor set out to create an estate called "Eaglefeather" on the 360-acre lot they owned in the Santa Monica Mountains above Malibu. Their grand plans included a house, a film-processing studio, stables, and paddock, along with other structures. Frank Lloyd Wright was commissioned to do the design. Unfortunately, the Oboler's dream was never realized. World War II created shortages that made construction difficult. According to architect E. Fay Rippon, the Obolers stopped working on the project because their son died on the construction site, but Oboler's waxing and waning fortunes may have also played a part in the project's demise. The gatehouse was built first in 1940. It appears in Oboler's film Five. The next year, a small studio was built for Eleanor on a nearby hilltop (you can see it in the next picture). Eventually, the gatehouse was expanded to its current size. This structure is the only example of Wright's desert rubblestone construction in southern California. Oboler enjoyed collecting rocks as a hobby and gathered many of the stones himself, from as far away as Arizona. The Obolers lived in the gatehouse until 1987, and it has had a few owners since then. In July 2018, real estate website Zillow estimated its value at $2.1 million. The lot covers 79 acres, and the two-bedroom house is listed at 2,486 square feet. Eleanor's Retreat was one of only two structures built out of a grander plan created for 1940s radio and television personality Arch Oboler and his wife, Eleanor. This small studio created for Eleanor stands on a hilltop near the gatehouse. The gatehouse and Eleanor's Retreat are located at 32436 Mulholland Highway, Malibu, CA. This location is about 10 miles inland from the center of Malibu. The buildings are a private residence and not open for tours, but you can see them from the road. The Gate House and Eleanor's Retreat are among nine Frank Lloyd Wright-designed structures in the Los Angeles area. 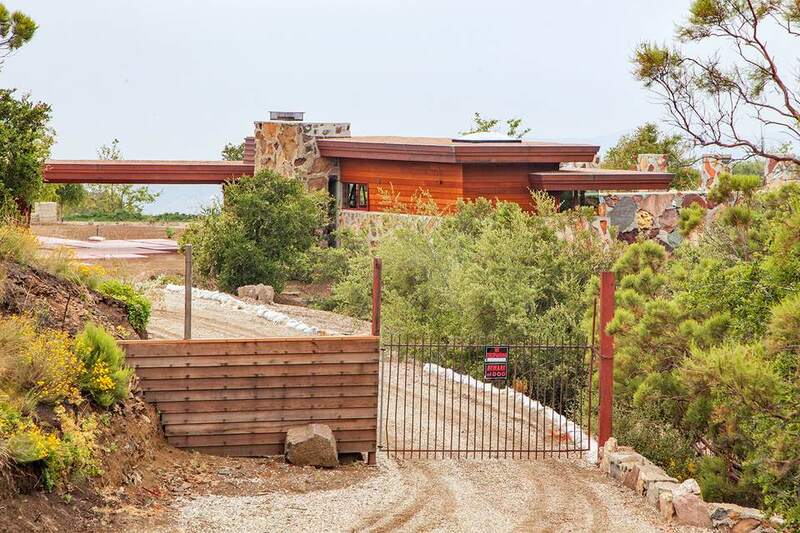 The Arch Oboler Gate House is one of a few California properties that Wright designed using desert rubble construction, a style he first used in Arizona at Taliesin West. The other California examples are the Berger House and the Pilgrim Congregational Church. Don't be confused if you find more "Wright" sites in the LA area than are mentioned in our guide. Lloyd Wright (son of the famous Frank) also has an impressive portfolio that includes Wayfarers Chapel in Palos Verdes, the John Sowden House, and the original bandshell for the Hollywood Bowl. If you're an architecture lover, check out famous Los Angeles houses that are open to the public, including Richard Neutra's VDL house, the Eames house (home of designers Charles and Ray Eames), and Pierre Koenig's Stahl House.